Environmentalists are using this occasion to assess Trump’s first year in office, but the verdict isn’t as clear cut as it might appear. Americans received a lot of good news about the state of the environment during Trump’s presidency. In April, the U.S. Geological Survey released an interactive map showing huge improvements in water quality across America since the passage of the Clean Water Act in 1972. 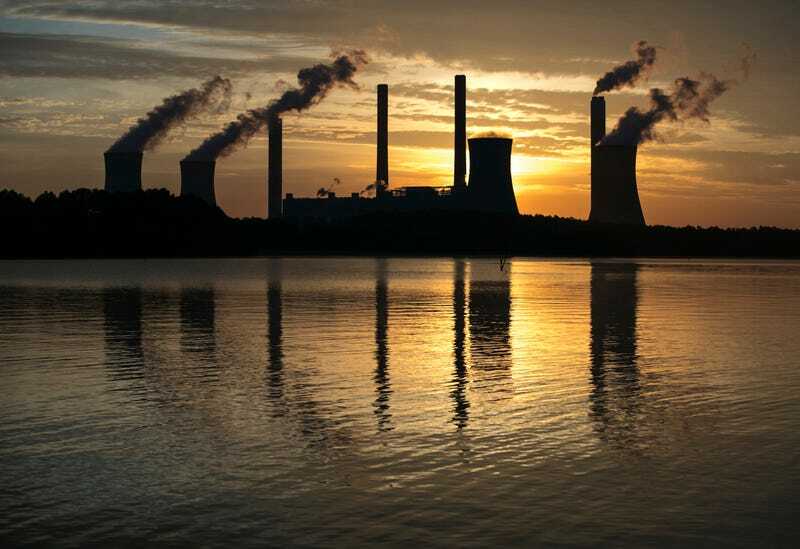 Also in April, the U.S. Energy Information Administration published data showing carbon dioxide emissions decreased in 2016, continuing a long, downward trend. This good news, however, is exactly why environmentalists are despairing. The above data does not show Trump’s impact on our air and water; it shows improvements made during Obama’s presidency. That is, it shows the gains that could be lost under Trump. For now, it’s impossible to determine the extent of how Trump’s policies have changed the environment. It takes a long time to compile and analyze pollution data from across the country, which is why we’re only now seeing data from 2016. But the projections for 2018 are not good. Trump’s trade policies will likely decrease demand for solar energy and slow the reduction in greenhouse gas emissions. His deregulatory agenda for coal waste will likely put more drinking water systems at risk. His decision to roll back regulations on toxic air emissions and carbon dioxide emissions will probably lead to increases in both. But emissions data is not the only way to get an idea of Trump’s impact. Public opinion can also be instructive. In March of 2017, Gallup reported that Americans were more concerned about water pollution than they had been since 2001. This was partly due to the drinking water crisis in Flint, Michigan, but not entirely. “The continued elevated levels of concern...come as President Donald Trump signed an executive order to roll back environmental regulations put in place by his predecessor to protect American waterways from pollution,” Gallup reported. The sheer number of environmental crises this year don’t inspire much confidence, either. America saw several record-breaking hurricanes and wildfires, the severity of which were made more likely by climate change. Each weather event, too, brought its own environmental crisis. Hurricane Harvey caused toxic air emissions to spew from refineries in Texas that were forced into emergency shutdowns. Millions of gallons of sewage flooded Florida’s streets due to flooding from Hurricane Irma. In California, wildfire smoke caused an air pollution crisis. And Puerto Rico is still dealing with contaminated drinking water from Hurricane Maria. In his address on Tuesday night, Trump didn’t assuage concerns about the worsening state of our air and water. He didn’t have to: For now, he can hide behind the lack of data on the effects of his environmental policies. Next year, he won’t be so lucky—by which time our union will be in an even more polluted state. This article originally appeared in the New Republic and is published here as part of the Climate Desk collaboration.